Family visits to our local grocery store make us feel grateful for the abundance of fruits and vegetables that we are able to bring home to our family table. Our farmers work hard to make this possible and they hold an important and necessary place in our community. What better way to give my girls an appreciation for the importance of our farmers then by getting down and dirty and working on a farm. For the next six months, my girls and I have committed to volunteering and working on a local farm. 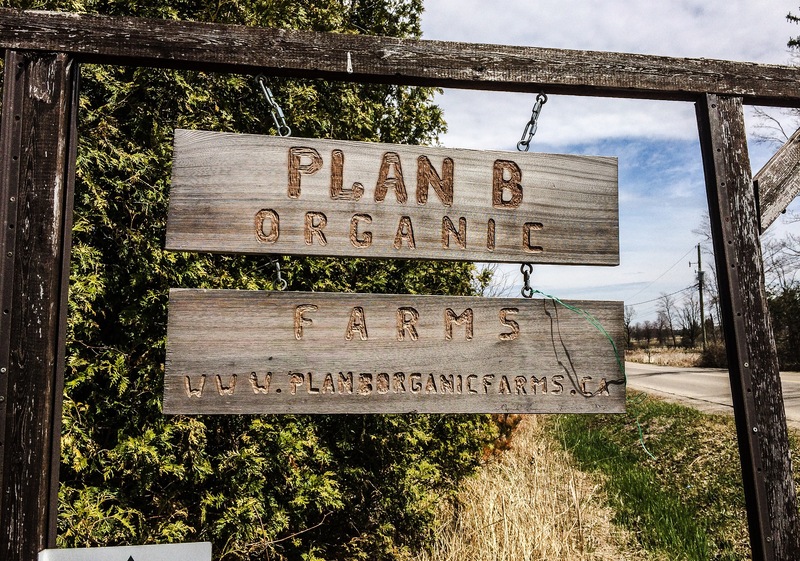 We have chosen Plan B Organic Farm as it is a local farm that are committed to growing delicious, high quality vegetables, herbs, and fruits using organic farming methods that are in harmony with our environment. They also provide accessible, affordable, and freshly harvested organic produce to households in their region. 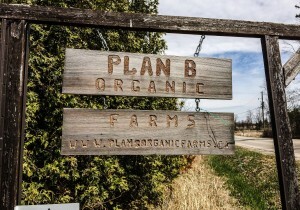 Plan B Organic Farm was established in 1997 by Rodrigo Venturelli, Alvaro Venturelli and Melanie Golba. 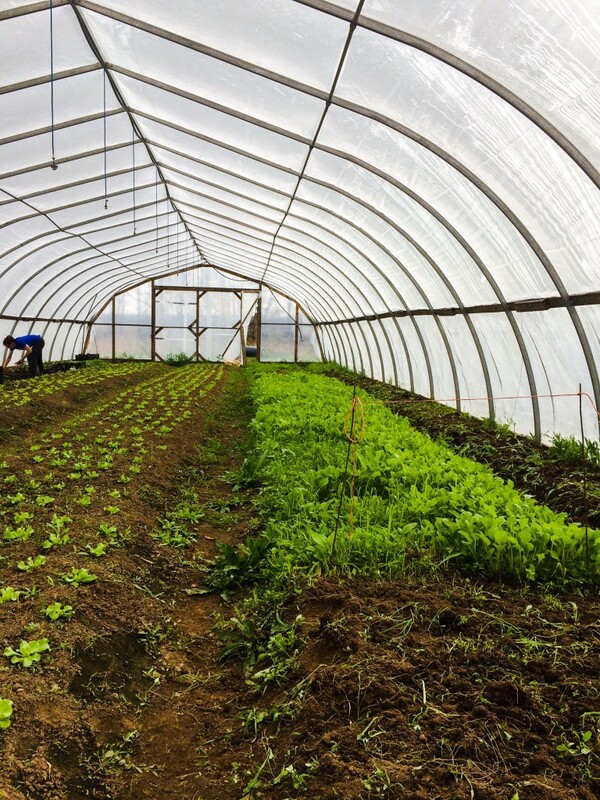 This will be their 19th season growing organic produce on their 50 acre farm in Flamborough. Visit their website at www.planborganicfarms.ca and read more about this amazing farm and what it has to offer. I am excited for my girls to be a part of this journey with me and I am thrilled to share our experiences from farm to table with all of you! 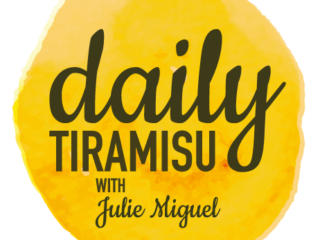 Follow us on our journey as I share weekly stories, photos and simple delicious recipes using the beautiful organic produce that we harvested on the farm. I hope our journey will inspire you all to support our Local Ontario Farmers! During my first visit to Plan B Organic Farms, crates of green garlic were prepped and ready for delivery. I was so excited when Mel, one of the owners of the farm, gave me a gorgeous bunch to take home to start recipe creating. 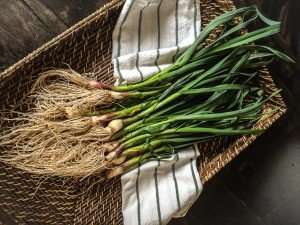 Green garlic is similar to green onions. It has a mild garlic taste and is available spring to early summer. 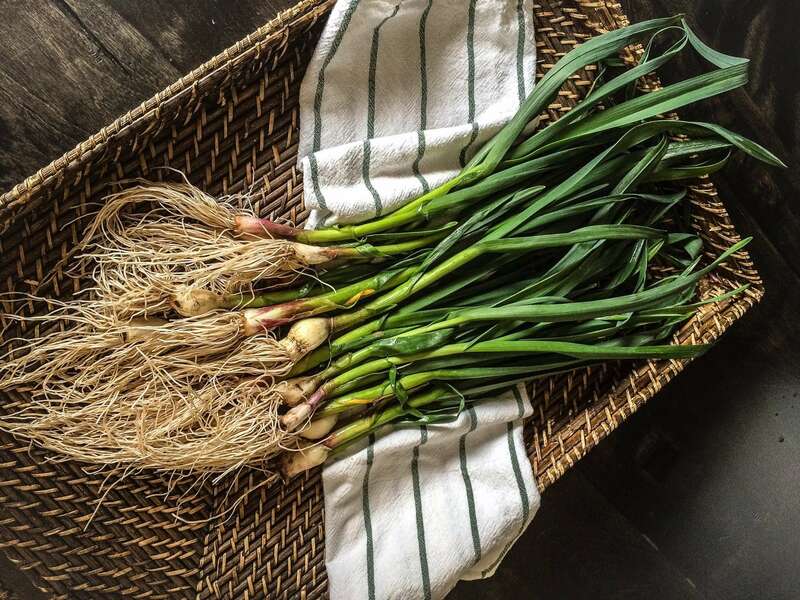 It can be used in just about any recipe where you would use garlic or green onions. 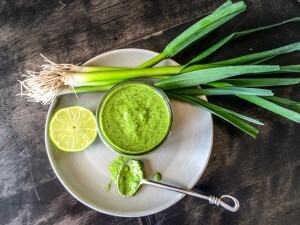 Here is one of my favourite ways to use green garlic: Green Garlic & Fresh Herb Citrus Sauce. This simple delicious and versatile sauce can be used as a salad dressing, dip and a fresh finishing sauce on grilled seafood, fish, meats and poultry. In a food processor, add garlic, cilantro, parsley and lime juice. Pulse until you have a smooth mixture with some chunks. Slowly add olive oil and blend until the oil emulsifies. 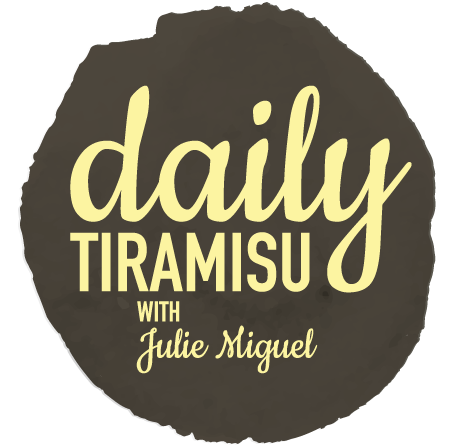 Any leftover sauce can be stored in a sealed jar and refrigerated for up to 1 week. Preheat grill or grill pan to medium-heat. Place shrimp in a bowl with olive oil, chili flakes, lime wedges and season with salt and pepper. Mix well to coat. Skewer the first two shrimp on a skewer and then one lime wedge. Skewer one more shrimp. Repeat with the remaining shrimp and lime wedges. Grill each side for 2 minutes until shrimp are opaque in colour. Place on a platter and drizzle with sauce. Serve immediately! Over medium heat, boil chickpeas with half their juice for a few minutes, until chickpeas are hot through. Take pan off heat and use a fork to mash them to a chunky consistency. Add olive oil, salt and pepper. Mix gently. Set aside to cool. 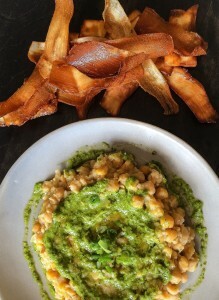 In the meantime make the yucca chips: In a large size heavy sauce pan, add oil and heat over medium-high heat. Line a platter with paper towel. Peel off the thick brown skin from the yucca. Use a mandolin or vegetable peeler and thinly slice yucca into strips, length wise. It is important that they are thinly sliced so the chips are crispy. When oil is hot, add yucca but don’t over crowd the pan. Fry while slowly turning the yucca to ensure they cook to an even golden brown colour. Remove the chips and place on platter lined with paper towel. Repeat and fry all of the remaining yucca chips in batches. Season lightly with salt and set aside. Place cooled smashed chickpeas on a serving plate. Drizzle with sauce and serve with yucca chips for dipping. 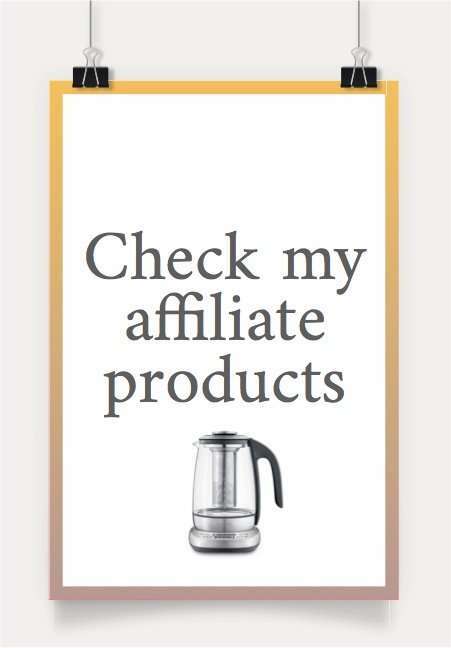 I hope you all enjoy my simple seasonal recipes!